(CNN) -- New Mexico Gov. 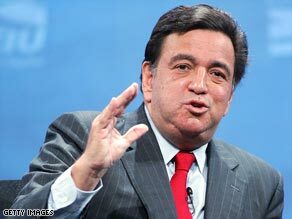 Bill Richardson signed a bill Wednesday repealing the death penalty in his state, his office confirmed. New Mexico Gov. Bill Richardson signed legislation repealing the state's death penalty. "Regardless of my personal opinion about the death penalty, I do not have confidence in the criminal justice system as it currently operates to be the final arbiter when it comes to who lives and who dies for their crime," Richardson said in a statement Wednesday. He noted that more than 130 death row inmates have been exonerated in the past 10 years, including four in New Mexico. "Faced with the reality that our system for imposing the death penalty can never be perfect, my conscience compels me to replace the death penalty with a solution that keeps society safe," he said. The bill replaces the death penalty with life without the possibility of parole. New Mexico currently has two men on death row and has executed one person -- convicted child killer Terry Clark, in 2001 -- since the United States reinstated the death penalty in 1976. As the legislation is written, it will not affect current death row inmates. "Throughout my adult life, I have been a firm believer in the death penalty as a just punishment -- in very rare instances, and only for the most heinous crimes. I still believe that," Richardson, a Democrat, said. "The issue became more real to me because I knew the day would come when one of two things might happen: I would either have to take action on legislation to repeal the death penalty, or more daunting, I might have to sign someone's death warrant." Rep. Gail Chasey, who first introduced House Bill 285 in 1999, said the bill would relieve families of the burden of a lengthy death penalty trial and appellate phase and restore the focus to crime victims. "Every time there is a court hearing, a conviction, an appeal, the focus is on the defendant, but the family still has to go through it all again and again. It's very, very hard for the families. It reopens the wounds each time," she said. The legislation will also spare the state cost of mounting a death penalty trial, which Casey said typically costs more than a non-death penalty trial. "We can put that money toward enhancing law enforcement, public works, you name it," she said. Richardson also said he was troubled by the fact that minorities are "over-represented in the prison population and on death row." Minorities make up more than half of the death row population nationwide, according to the Washington-based Death Penalty Information Center, a nonprofit group that opposes the death penalty. The American Civil Liberties Union said Richardson's decision should "send a powerful message to other states" about the need to reevaluate "our error-prone, discriminatory and bankrupting system of capital punishment." Local and state law enforcement associations opposed the bill. Richardson agreed the death penalty is a tool to deter crime, but said it was not the only tool. "For some would-be criminals, the death penalty may be a deterrent," he said. "But it's not, and never will be, for many, many others." The state legislature approved the measure last Friday. Prior to signing the legislation, Richardson received thousands of e-mails and phone calls weighing in on the matter. As of noon Wednesday, the governor's office said it had received 10,847 phone calls, e-mails and walk-in comments from people who wanted to voice their opinions on the legislation. Of those, 8,102 were for a repeal of the death penalty and 2,745 were against it, according to Richardson's office. In addition, Richardson met Monday with more than 100 New Mexicans to discuss the issue, his office said. Other states also have considered repealing their capital punishment laws this year. In Kansas, state senators voted Monday to send such a bill back to committee, The Kansas City Star reported. CNN's Emanuella Grinberg contributed to this report.